Happy Saint Patrick's Day! Seeing all the green cupcakes, cookies and bagels as I rushed through Grand Central this morning on my commute to work made me happy. I know green food coloring doesn't make them taste any different, and it's really quite silly, but it adds an undeniable festivity to the day. According to the Woman's Encyclopedia of Myths and Secrets, Saint Patrick is probably a fictitious figure built on the image of a Roman priest. However, Saint Patrick has numerous pre-Christian pagan precedents. One of those is the old Irish god of the shamrock, Tefuilngid Tre-eochair, "The Triple Bearer of the Triple Key," whose plant bore all edible fruits including the apples of immortality. Eve's apple in an earlier form? The god of the shamrock was believed to have been the son-consort of the ancient Triple Goddess (called Briget in Ireland) whose triple "yoni" had been represented by shamrock designs from the time of the earliest civilizations of the Indus valley. Thus, the story that Saint Patrick explained the Christian trinity to the Irish by showing them a shamrock is entirely apocryphal. 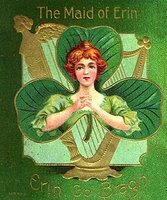 The Irish had the Goddess, and her shamrock symbol, long before Saint Patrick and his fellow Christians set out to convert them and co-opt their pagan symbols. Approximately 13 years ago, before I heard that the shamrock was a symbol of the Goddess, and long before I believed in Goddesses, I went with my brother Thor and my friend Mace to get a tattoo. I was seventeen years old. It was the summer before my junior and senior year of high school, and the three of us were working together at the Town Park in our small town in Connecticut as life guards. Mace decided to get a flower, and Thor chose a dark purplish shark in the shape of a circle - with the mouth of the shark just about to close on the shark's tail - on his shoulder. I didn't want to get a flower (even though Mace's was very pretty) because everyone got flowers. So instead, after much thought and flipping through books filled with pictures, I decided on a - drum roll please - four-leaf clover. I was a little dreamy back then, and to me it symbolized far more than luck. It represented destiny and fate, and some sort of magic out in the universe that connected me to some higher purpose that I had yet to discover, but was confident that I would eventually figure out. No, I was not on drugs. Since that time, Mace has had her tatoo removed, and my ideas about spirituality and the meaning of life have grown and matured. I recognize now that the ideas I was just beginning to explore back then were my very early post-Christian (I rejected the white male Christian sky God at the age of 13) Agnostic/Atheist/Buddhist conceptions of Karma, reincarnation, and the notion that we are all connnected and each of us has a purpose on this earth. I still haven't ironed out my spiritual beliefs, and I most certainly have not yet figured out my purpose in life, but I'm working on both. Reading today about Saint Patrick's pagan precedents, it made me smile to realize that even in my ignorance at 17, by stamping my body with the image of the shamrock (granted a 4 leaf clover instead of a 3 leaf one, but give me a little slack here), I was unknowingly tapping into a spiritual image that I would only years later begin to connect with. Who knows, maybe the Irish Triple Goddess Brigit (having forgiven me for my extra leaf because she is no doubt a forgiving Goddess) has been watching over me for the past 13 years. In honor of Saint Patrick's Day, I think I'll light a candle to her today to say thank you. Just in case. Then I'll go out and drink some green beer. I'm sure she would appreciate that too. Thank you. Now I will never be able to look at a shamrock without thinking about "yonis." And you never said where on your body you got your tattoo. Hee hee. Signs of the goddess are apparently everywhere despite the church's best efforts to the contrary. It's about 3 inches below my belly button over to the right (near my right hip bone). I've actually long been nervous that when and if I get pregnant, this humongous giant shamrock is going to stretch out across my distended belly. My Dad said this would happen. And then, can you imagine green stretch marks?? The horror.